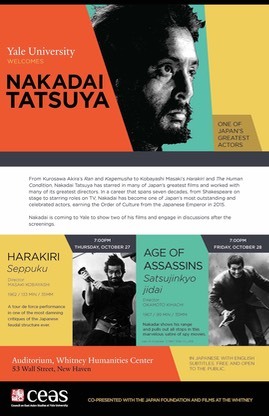 Our big Japanese film event at Yale this fall is a visit by the illustrious actor, Nakadai Tatsuya, on October 27-28, 2016. One of my favorites since high school, I am thrilled with the opportunity to welcome him to Yale and talk to him about his work. 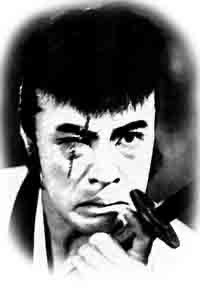 We’ll show two of his films, with Q&A—Harakiri (Kobayashi Masaki, 1962) and Age of Assassins (Okamoto Kihachi, 1967). He will also do two talk sessions with a smaller audience that are by registration only. He’ll also be catching some theater while he’s here. This year is the centennial of the birth of Kobayashi Masaki, with whom Nakadai made some of his best films. He thus insisted on doing at least one Kobayashi film. We talked at first about doing two, but he was intrigued about doing an Okamoto film, so that’s the second one. Nakadai will also do some events in New York, but we hope people can make the trek to New Haven to catch Nakadai in a more relaxed and intimate atmosphere. I’ve met him a couple of times in preparation for the event—which itself was a thrill!—and I was so impressed with what a charming and wonderful human being he is. At 84 years old, he still works full-time and runs his own acting school/troupe called Mumeijuku. He’s acted in so many media and had a career spanning seven decades, so there is so much he can share with us. Hope to see many of you here!